Cherry gave the pillow a poke and sleepily sat up. She shook her short, black curls off her red cheeks, and wriggled to the edge of the bed to see out the window. She was in the one place where a lively young nurse never expected to be — home! She was right here in her own room, in her own house, in her own small town of Hilton, Illinois. 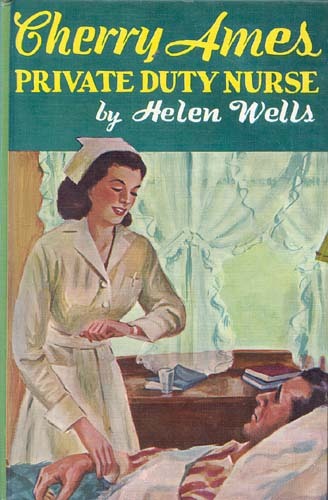 Her gay read-and-white room with its sun-filled windows was a highly satisfactory place to be, this sweet-smelling June morning, especially after traipsing with the Army Nurse Corps from the Pacific across the Atlantic, with flights in between, and then being a veterans’ nurse besides.